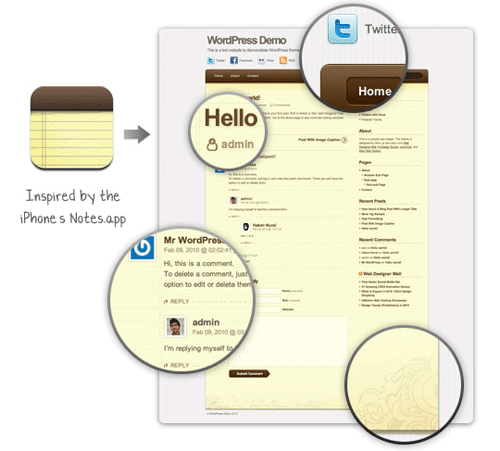 Notepad is a design originally created for WordPress by N. Design, and ported to Blogger by Blog and Web and BTemplates. It is a simple but legible and well designed template. It has two column, space for social services, support for static page and font and colors settings from the panel. You can read our FAQ section to see how to install a blogger template. To add links to the menu simply create a new static page from the Dashboard. Change all href links, for yours. Change the format of Date Header Format (Dashboard → Settings → Formatting → Date Header Format) for the penultimate option. This template is released under GPL. If you remix, convert, translate, modify, or distribute a copy of this theme, please keep intact the links/credit in the footer (Not remove or add links on the credits). hey! this is such a nice template. how can i change it’s language? How can I activate the “more” tag (<!–more–>) in this theme? Can I find somewhere this template with THREE columns? Como hago para que se pueda ver el leer mas? How do I go about adding navigation to labels rather than pages? Hey, some images of this template don’t show up anymore. Please fix. What do u mean by change the href link? It’s my first time attempting to make a blog so I was just wondering.